This week’s episode of NCIS: Los Angeles was a curious offering, featuring two very distinct storylines. The team - sans Callen - investigate the disappearance of Navy Lieutenant Commander Timothy Wier, leading them to discover multiple serial killers stitching body parts together to create a ‘Frankenstein Monster’ for a fee via the dark web. Callen meanwhile, is ordered to partner up with Mosley to assist the AFT in locating and arresting arms dealer Spencer Williams, who’s selling $45 million worth of weapons stolen ten years ago. The unrelated cases have a very different feel about them and episode writers Frank Military and Adam George Key have the task of meshing these together in the space of 43 minutes, ensuring enough screen time is dedicated to each so the viewer is equally invested. Trust is once again an overriding theme which features in both cases. The team do not trust Mosley, which is reciprocated and somewhat exacerbated due to Callen's poor relationship with her, something which again is a recurring theme. He had a similar lack of respect for Acting Operations Manager Lauren Hunter in late season 2 / early season 3, and then with Assistant Director Granger for several seasons. In fact the only authority figure he does respect is Hetty and even then he still disobeys her on occasion. Paranoia is rife, particularly as the field agents can see Hetty and Mosley arguing in the latter’s office. The team is summoned to ops with Callen singled out by his exclusion, confirming to all that he is the subject of their disagreement. This signals the team to start voicing their concerns that Callen is about to be fired, and Hidoko is there to replace Nell. Already Sam has said he’ll go if Callen is fired and this is repeated by Deeks in ops; interesting as Deeks was the one who diametrically opposed Callen’s actions last week. Callen and Mosley’s confrontation in her office reveals how little respect Callen has for her. Her opening gambit does nothing to allay his fears that she wants to break up the team and fire him. The thought of them being partners forces Callen to state that she won't force him to quit. The battle of wills continues in the AFT operational centre where Callen is restricted to the role of silent observer, which quickly allows him to understand Mosley is keeping secrets and has a vested interest in finding Williams. When Callen does attempt to contribute Mosley talks over him. It is also apparent that Mosley does not play well with other agencies and a power struggle ensues between her and AFT Agent Swan. 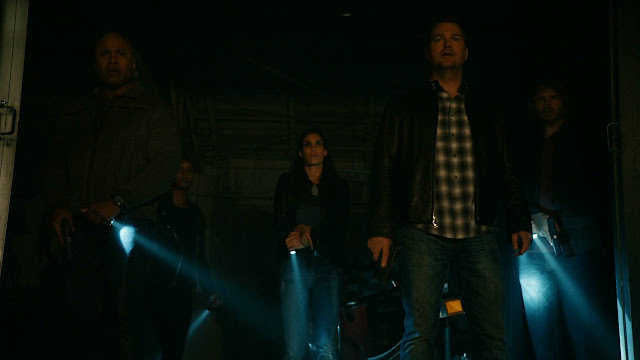 Despite being almost forced to be a little honest with Callen about Wiliams, Mosley continues with her own private agenda, undermining Swan's authority and giving Callen conflicting orders whilst he's undercover, orders that could potentially place his life in danger - he volunteered to replace Agent Hodges who was earlier killed whilst AFT/NCIS observed. It’s the ATF’s operation and Callen makes the right decision in disobeying Mosley. True to character Mosley refuses to accept responsibility, blaming ATF and Callen for allowing Williams to get away, later telling Hetty as much. Hetty has a key but minimal role of this episode. It is her persuading or manipulation of Mosley that means the two are paired up. Hetty has won yet another battle with the Assistant Director as Callen's decision in the field allows them to have a crucial conversation about being honest with her team to built trust in allowing them to find Williams and by default, her son. If there is ever a way to manipulate Callen, it is to throw in a story about lost children. Again she opens the conversation in a rather confrontational manner which of course Callen reciprocates. Mosley has already challenged the team's methods and now states she chose Callen as her partner as he's the best agent she's ever worked with - not for the reasons clearly running through his mind. Mosley has previously challenged the team's modus operandi and now she's praising the leader's work? At Mosley's eventual honesty and tears, he softens his stance, and this plot line will pick up again towards the end of the season. Mosley now faces a dichotomy between her personal and professional missions. She's previously admitted to Hetty she has orders to split up the team, yet she needs them to stay together to find Williams and her son. Trust also features heavily in the serial killer storyline. The team’s investigations lead them to breakdown garage where the Wier’s car was towed. It turns out the mechanic Griffin who towed Wier, served time for murder and mutilation. His repeated pleas of innocence, solid alibis and his colleagues openness in giving him a second chance seem to exonerate him. Such resolute trust (and the alibi) reluctantly mean Kensi and Sam are forced to believe him, which makes the final twist even more pleasurable. Griffin and his co-workers killed the garage's actual owners and staff, and impersonated them. The show ended with the full team revisiting the garage to find the body parts of the real garage workers sown together and on display. Is the end of this particular case? FBI Agent Rand confirmed this was an FBI case when no risk to national security was found, however the closing scene might suggest otherwise. If so, hopefully it won’t be Kensi who yet again suffers and has to be rescued by the boys. There is a lot of familiarity in the dialogue of this episode and it seems to be deliberate. Sam and Callen have previously had conversations about Sam being a control freak and a similar conversation now occurs between Sam and Kensi. Kensi also likes being in control – and as such is desperate to drive the Challenger. Sam’s response (that he would have to be injured and unconscious) is the same one he would and probably has given to Callen. The partner switch also sees Deeks and Hidoko teamed up for the first time. Hidoko resists Deeks’ personal questions about her surname and his attempt to bond fails spectacularly. This is similar to a season 3 episode when Hunter pairs up Kensi and Callen, with Kensi suggesting they open up. This also fails when they both agree it’s a bad idea. Deeks later attempts to bond again and talks about settling in to the team and his first encounter with Sam in the MMA ring. Despite being the new kid on the block they are all now family. It does seem that Hidoko has heeded Mosley’s warning from last week and states she is happy to be loyal to Mosley. The opening bullpen scene featured Kensi and Deeks discussing wedding plans, reminding the view that plans are afoot and they dearly love each other. Minutes later there is also a reminder that Mosley does not approve of their relationship. This ties in to Wier's girlfriend who is eventually revealed to be an undercover NSA officer. Even by taking precautions of embedding tracking devices in each other, Wier was murdered. It may have been an opportunistic kidnapping/murder but as has been the case on and off during recent seasons, this is another warning about the danger of relationships in law enforcement. The filming of Wier's murder is all suggestive. There is no gore although later there are images of body parts stitched together. Amid such horrific scenes, there is some beautiful backlighting that accentuates the almost crucifix like pose of Wier, who's murdered in front of an audience in a disused theatre. In line with the horror genre there is a terrific scream from Wier's girlfriend after she discovers him and the episode closes with suitably creepy music when the team discover another Frankenstein body. It is a difficult task to manoeuvre two separate storylines and at times it felt like there was quite a disconnect between the two. Neither were particularly fast paced and the serial killer line in particular was full of information. The scene is now set for Mosley to progress in her search and for her to start working closer with the team. It remains to be seen as to whether the serial killers will return, or it it truly was a random case that now sits squarely with the FBI.